The problem that the Ingredients Stack Container solves is saving time locating and storing ingredients used for a single meal which People/Chefs consume time locating ingredients while shopping and while in the kitchen. The Ingredients Stack Container provides users with a cylindrical container designed to hold prepackaged ingredients used to create a single meal, which ingredients for a recipe are commonly purchased in separate containers at a grocery store. 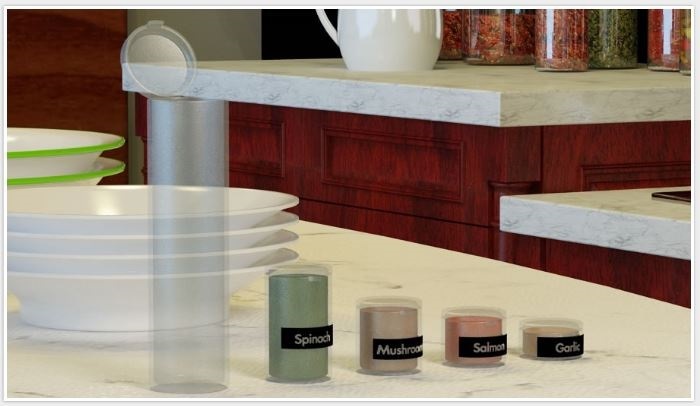 When it comes time to create the recipe, chefs must spend time locating each of the ingredient containers in a kitchen. People on a busy schedule may be unable to cook healthy, gourmet meals due to the time-consuming process of purchasing, looking for, and then cooking ingredients to fully create the recipe. Page created at 2019-04-21 4:46:38, Patent Auction Time.